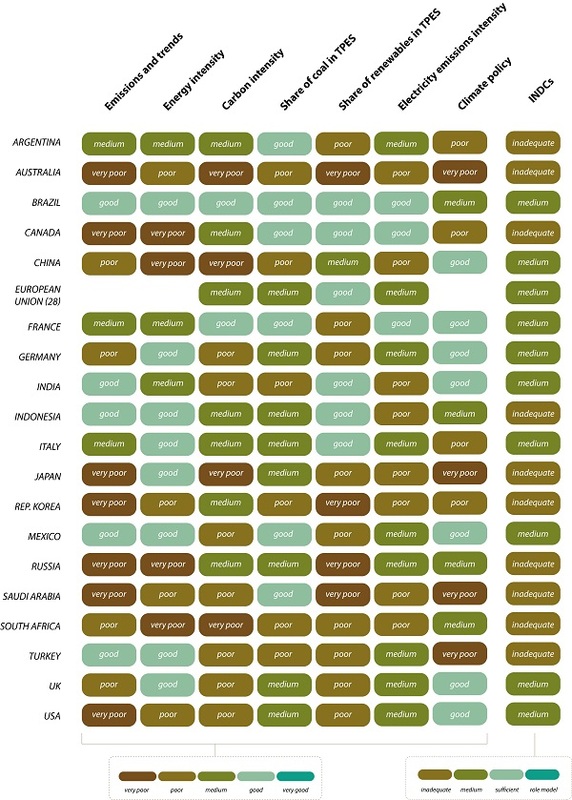 Climate Transparency have prepared a report Green to Brown: Assessing the G20 transition to a low-carbon economy ahead of the 2016 G20 meeting in China last weekend. There is a handy summary at The Climate Council. The countries’ 2030 emissions reduction targets (otherwise known as its INDCs) were about half ‘inadequate’ and half ‘medium’. The categories ‘sufficient’ and ‘role model’ were nowhere to be found. Australia was ranked ‘inadequate’. There’s more at The Guardian. After the Paris Agreement last December the United Nations Convention on Climate Change (UNFCCC) the “invited” the IPCC to do a special report on limiting global temperature rise to “well below 2°C” and to “pursue efforts towards 1.5°C”. Recently in Geneva a meeting was held to scope the report and throw in a few ideas, according to Carbon Brief. The joke is that the report is due for delivery in September 2018, which will be “in time for” the UNFCCC’s “facilitative dialogue” scheduled that year. That will be too late to stop 1.5°C warming, however. So the report will be about feasibility, overshoot and sucking CO2 out of the atmosphere. And about the implications of not doing so. Seems as though the Great Barrier Reef will be cactus, whichever way we go. 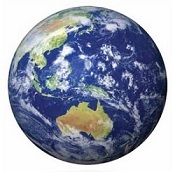 The third and final part of the Climate Change Authority’s special review was published recently as Towards a climate policy toolkit: Special Review of Australia’s climate goals and policies. It was meant to tell the Government what it needs to do to meet its obligations under the Paris Agreement negotiated last December. Two of the members, David Karoly and Clive Hamilton, wrote a minority report. In simple terms, the report allows the Government to retain the status quo in terms of targets, and recommends two carbon trading schemes. The minority report says we should adopt a ‘carbon budget’ approach, and if we do then 90% of the budget will be used up with a 28% 2030 target, necessitating emissions to drop like a stone at that point to achieve zero in 2035. The report allows the Government to continue doing nothing much about climate change. The Government will review the review and develop its post-2030 strategy in 2017. You can download the report and associated documents here. Perhaps start with the media release, then the media release of the minority report, then Christine Milne’s sad reflection Climate Change Authority cops out – just when we need it most. In other words it has been suggested that the CCA dissenters resign. They won’t. Josh Frydenberg, if you want to listen to him on ABC RN The World Today (they don’t do transcripts any more) thinks the main report is just fine. He stresses our progress in per capita terms, but in those terms we are still champion emitters and should make a special effort. Speaking of sensitive, ethical, prudent, and responsible action, the government is surely at its most sensible when campaigning to radically destabilise the earth’s climate systems. Don’t sweat those soaring temperatures; I’m pretty sure Turnbull’s main man, climate denier Craig Kelly, has it covered in his new role as chair of the backbench environment and energy committee. The Prime Minister says “meet us in the sensible centre”. It’s a reasonable request, except for that fact that the “sensible centre” is morally repugnant, thoroughly corrupt, and utterly insane. Let’s sensibly, rationally, reasonably, prudently, soberly, and thoughtfully, tell Malcolm to get stuffed. 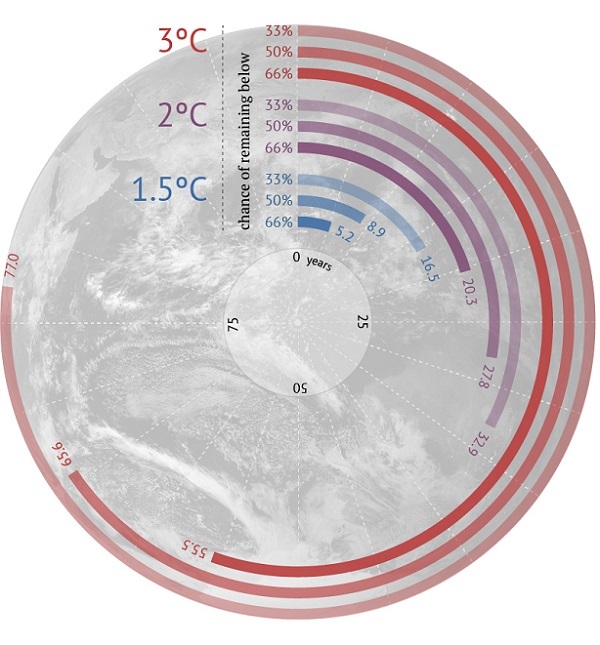 Carbon Countdown: How many years of current emissions would use up the IPCC’s carbon budgets for different levels of warming? 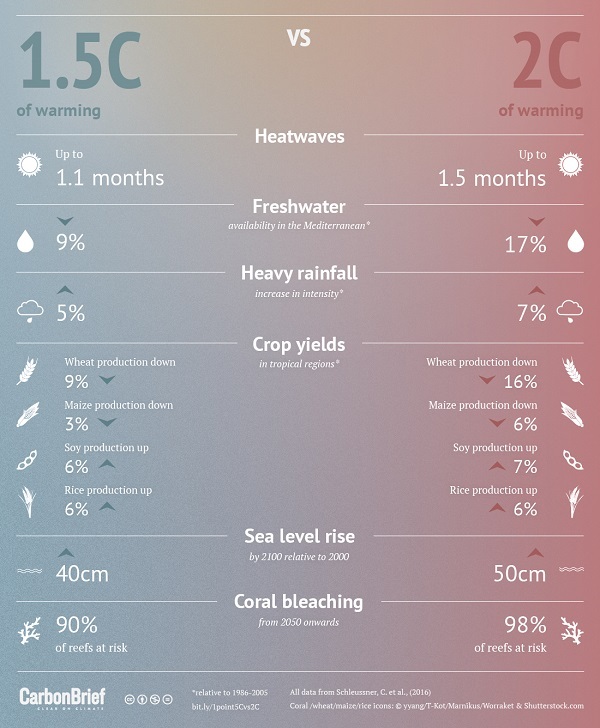 Infographic by Rosamund Pearce for Carbon Brief. That is, at current rates the carbon budget for a 66% chance of the world staying below 1.5°C warming will run out in 5.2 years. The US and China have formally joined the Paris climate pact, which is something, but well short of a 1.5°C outcome. After all that bad news, you might need a cup of coffee. Enjoy it while you can. It’s a $19 billion industry world-wide with 2.25 billion cups of coffee consumed every day. A new report suggests that production could be cut by half by 2050 because of climate change. I’ll try to look for better news in the next edition of CC! Go Brian. That’s fightin’ talk. Looks like we are going to be eating more soya beans ad rice? What was not shown was the effect of climate change on kJoules food production and protein production. The table suggests that the answer may not be as simple as we think. Wow! Australia is an important player after all. We are in the Big League along with Russia and South Korea. Do we win a Lead or a Mercury Medal for that?